Orthodox Church liturgical Subdeacon clergy vestments (blue-gold) by Istok Church Supplies Corp.
Finding a traditional, high quality Orthodox Christian sub deacon’s vestment set for an affordable price can be a time-consuming process. 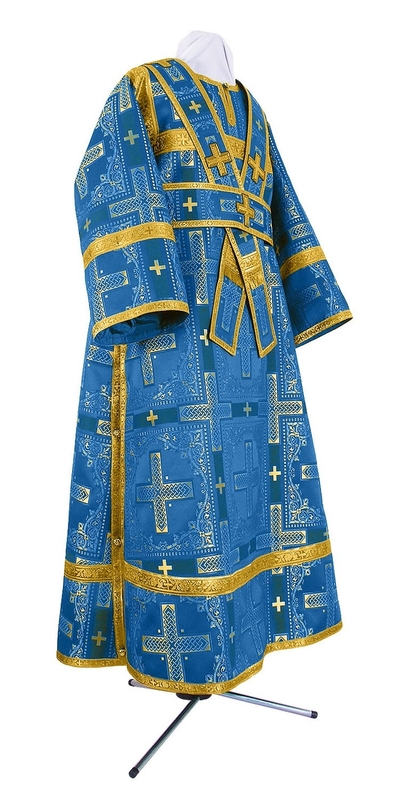 Istok Church Supplies aims to make it easier by offering an extensive collection of sub deacon vestments (Blue-Gold) that are made using best ecclesiastical fabrics, decorated with high quality embellishments and constructed by experienced liturgical tailors. We understand that in Orthodox Christian clergy hierarchy, a sub deacon hold the highest place among the minor order and has many important duties assigned to him. Our sub deacon vestments (Blue-Gold) will allow him to carry out liturgical duties with dignity, authority and complete comfort. We use only the best quality liturgical fabrics such as rayon brocade and metallic brocade for our sub deacon vestments. Fabrics are available in a variety of shades and customers can choose a particular product as it is or opt for a different fabric belonging to the same class by going through available choices in the Fabrics section. Each sub deacon’s vestment set includes two items – the sticharion and the orarion. While every vestment comes with natural rayon lining for enhanced durability and comfort, customers also have the option of adding natural velvet inserts to their order. With our vast selection and various customization options, we aim to provide affordable vestments and hope to serve the requirements of all Orthodox Christian churches. Customers can choose from three different types of embellishments – economy, standard and premier. Embellishments include crosses and galloons that add to the grandeur of these vestments. We are the go-to online supplier for customized church vestments of all kinds including sub deacon vestments (Blue-Gold). If you desire a perfect fit, just provide us your measurements by referring to our online measurement chart and our experienced tailors will ensure you receive perfectly fitting vestments that look great and hang well. Our sub deacon vestment prices are considerably lower than what you find in brick and mortar stores. If you don’t believe, just browse our collection and discover for yourself!